A man from Manchester was shot in the head as he sat outside a cafe in Amsterdam, in what Dutch Police believe was a "gangland feud". Police say the 55-year-old victim, originally from Sale, remains in a stable condition in hospital following the attack by a suspected hitman on May 19. The suspected gunman, who is wanted for attempted murder, had earlier been seen walking towards the premises in Amsterdam’s Stromarkt. He is then reported to have pulled out a handgun and fired at the victim, before taking a bicycle taxi in the direction of the Dam. Despite a large scale search, the Dutch authorities say they are yet to track him down and are now working closely with the NCA. Police are now appealing for help in finding a man pictured on CCTV who is wanted in connection with the incident. A witness described him as speaking English with a north-west accent – possibly Merseyside or Manchester. 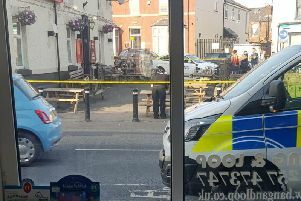 Jayne Lloyd, North West Branch Commander, said: “The attack took place in a public area. This man is clearly very dangerous, which is why we need to identify him quickly and make sure he cannot harm anyone else.